Melanie is a research associate in the DeVos Center for Religion and Civil Society at The Heritage Foundation. The U.S. government helped facilitate the abortion of an illegal minor’s unborn child. The lives of more than 58 million American children have been ended by abortion. Pro-life Americans should continue striving for the day when every human being, born and unborn, is protected in law and welcomed in life. The U.S. government helped facilitate the abortion of an illegal minor’s unborn child early Wednesday morning, after the Trump administration had fought to prevent such a scenario. The abortion came after a tragic ruling from the D.C. Circuit Court of Appeals on Tuesday, which ordered the government to allow the woman to obtain the abortion. The young woman was approximately 16 weeks pregnant, meaning her baby was the size of an avocado, had started growing toenails, and his or her heart was pumping 25 quarts of blood per day. The case has captured the attention of Americans on both sides of the abortion debate for weeks, and today’s news of the abortion is being heralded as a victory for “justice” by the abortion lobby. Instead, it should be viewed as a heartbreaking end to a legal saga that resulted in the death of an unborn baby boy or girl. The minor known as Jane Doe, or J.D., has been in the custody of the United States Health and Human Services Office of Refugee Resettlement. J.D. has been at the center of a fast-moving legal battle surrounding her desire to abort her unborn child and the Office of Refugee Resettlement’s desire to not facilitate the procedure. J.D. has been in the country since September and has been held at a government facility in Brownsville, Texas. Texas law bans abortion after 20 weeks of gestation in most cases, hence the court’s rapid movement on the case. Texas law also stipulates that a minor obtaining an abortion must have parental consent or the approval of a judge. J.D. received approval for the abortion by a state court. But the Office of Refugee Resettlement has a policy of not facilitating elective abortions for minors, so the Brownsville facility declined to transfer J.D. to an abortion facility or permit her to leave its custody with an appointed guardian to obtain an abortion. J.D.’s guardian, represented by the American Civil Liberties Union, took the matter to district court where Obama appointee Judge Tanya Chutkan ruledthat the government’s policy is an undue burden on a woman’s right to abortion, according to the Supreme Court’s Planned Parenthood v. Casey decision. The court ordered that the U.S. government either take J.D. to obtain an abortion, or release her to be transported by the court-appointed guardian to obtain the abortion. The government appealed the decision to a three-judge panel on the D.C. Circuit Court of Appeals, which ordered that the government to find and approve a sponsor for J.D. by Oct. 31. The Office of Refugee Resettlement has an existing policy in place to release unaccompanied minors to an approved sponsor. By following that protocol, the government would have been able to continue its policy of not facilitating abortion. But J.D.’s attorneys quickly requested that the full D.C. Circuit rehear the case, arguing that J.D. 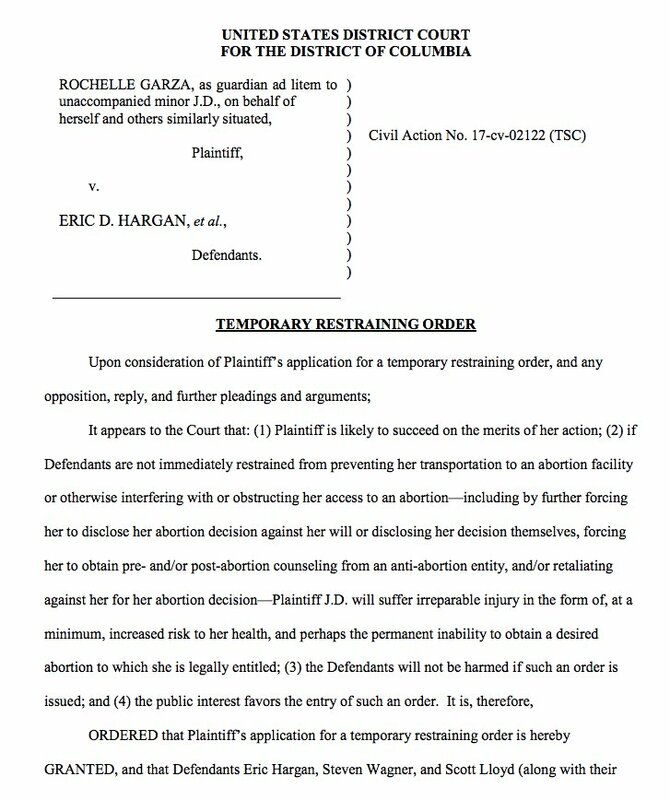 had already received a state judge’s approval for an abortion and that after already a month in custody, no sponsor had been found, making it unlikely that one could be found by the Oct. 31 deadline. The full court agreed to rehear, and in a 6-3 decision on Tuesday sided with J.D. and the ACLU and remanded the case back down to the lower court, meaning the judge could revise her previous order that J.D. obtain an abortion. As abortion advocates celebrate the court’s decision that ended the life of an unborn baby boy or girl Wednesday morning, it’s worth noting that since Roe v. Wade in 1973, the lives of more than 58 million American children have been ended by abortion. For over 40 years, the pro-life community has worked tirelessly to counter the devastating impact abortion has had on mothers, fathers, and their unborn babies. It has borne witness to the fundamental truth that from the moment of conception, a distinct human being with inherent worth and dignity has the right to life—including the unborn children of minors in the government’s custody. Wednesday’s news is heartbreaking, but it can strengthen the resolve of pro-life Americans to continue striving for the day when every human being, born and unborn, is protected in law and welcomed in life.